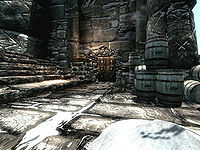 The Warehouse is a location in Windhelm which serves as a storage for the docks. Inside are a plethora of barrels, crates, and sacks to store the various goods in the warehouse, as well as two carts for transporting them. It can be located on the quieter eastern end of the docks, just to the left of the gates to Windhelm proper when exiting the city and entering the harbor. The double doors that serve as the entrance are surrounded by a multitude of barrels on one end, not currently properly stored inside the building, and the steps leading to the higher portion of the docks. A lone brazier provides illumination for the entrance. While the warehouse is not properly secured with a lock and it is not illegal to ever enter it, all of the contents inside of it are formally owned, and cannot be taken without stealing. However, as no one will ever enter here as part of their normal schedule, it is fairly easy to rob. The building itself is a bit disorderly, with many random containers filling up the room in disorderly piles. The room is well-lit, with three chandeliers providing lighting. Six giant wooden beams, with three on both sides of the building, provide support to the heavy stone structure. Less sturdy wooden rafters provide additional support. While most of the containers in here are entirely static and cannot be opened, the few that can be opened for the most part contain foodstuffs. 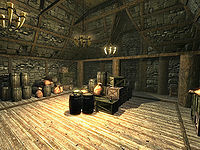 Notably, a knapsack hidden behind some crates at the far side of the building from the entrance has some more valuable items, such as jewelry, books, a potion of restore health, gold, as well as less valuable items such as food or common clothing. Additionally, a few items randomly sprawled across the room are of note. A solution of enhanced stamina can be found on the floor next to a chair to the right when entering the room. To the left of the entrance is a philter of strength. Besides that, there are a few random drinks, baskets, gold pieces, plates, mugs, and a broom littered throughout the room. This page was last modified on 16 October 2013, at 16:21.